here's a new one. A military issue Dubow "Enos Slaughter" model 366. It's typical 40's era, big and built like a tank. I've always liked the patented outseams on the finger stalls and one of the coolest wrist strap buttons around. The deep reddish color of the leather is what really grabbed me though. When I bought the glove, it had no webbing. I just couldn't pass it up though because the leather quality/condition was so nice. I saw on JD's site that the model 366 came with a "Doak" style H-web. I searched through my "bone yard" and found two matching tunnel webs and created the rolled lace "Mantle Tribute H-Web". That was fun! Sweet glove, Mike. Love what you did with the web! Well done Mike. I have the 339 Billy Herman but it's a lower quality model. It does come with the very rare watch-web though. I don't know why it didn't catch on. I suppose it was ahead of its time. 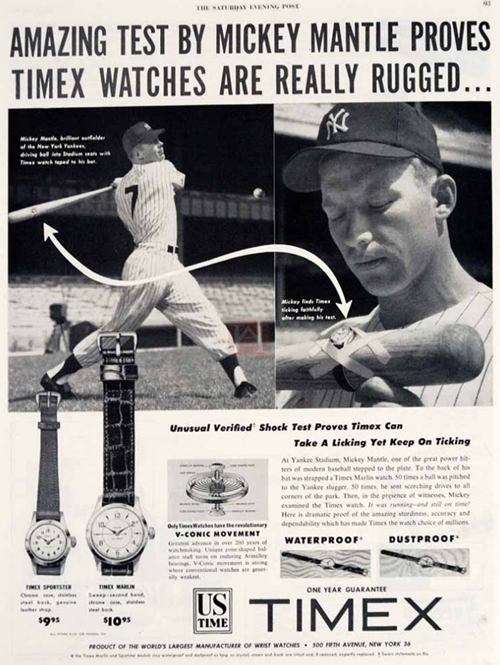 Ata, your watch web reminds me of the old Timex commercials where they would wrap a Timex watch around a baseball bat, sledge hammer handle, or whatever to show how tough it was. "Takes a licking and keeps on ticking." Believe it or not, I bought the same model Slaughter glove from Richie B. a short while ago. Aside from the web, they are twins. It was the first Dubow I've seen with a "Doak style web." Big, well made glove. The leather they used was terrific. okdoak wrote: Ata, your watch web reminds me of the old Timex commercials where they would wrap a Timex watch around a baseball bat, sledge hammer handle, or whatever to show how tough it was. "Takes a licking and keeps on ticking." Always one-upping me Greg. I'll one-up myself and show you my new cATApillar web. Patent pending. I'll stop now. That must be what they call a transition web. A pre butterfly or moth web. You win this round, Ata. Hello all! I have recently come into a glove and I can't find another example. It's a Reach Babe Ruth Home Run edition Catcher's mitt. What makes this one a little more unique is - it's a Canadian model! My questions - does it being Canadian affect it's value? I assume it's rarer? also does anyone have any opinions on the condition etc? Thanks so much. I can't figure out how to link to images so here is a link to the album of 6 pics. Thanks so much Mike! I thought it was in great shape too. The rivets still have the black paint! And the strap still is black! I would call it (for lack of a better term) EX? or 8/10? I did a cursory search for value but it seemed prices were over the map. I found a facebook group that collects old equipment (i could not figure out how to get images on this forum so I was looking around...). Having the model is fantastic. Thanks. I assume it's 1920's or so? Thanks again for your help. And thanks for the link to that page! Wow!! A circa 1960 Nokona "Jim Lemon" model TST10 glove. I had been looking for one for few years with the "FingerLok". I picked it up a few months ago. I've never had a TST model. I like the heel break on both the thumb and pinky side. I think it was really well designed and a super glove! I wanted a TST model to go with my "Roy Face" model DH with the "FingerLok". By some lucky coincidence, it looks like the two gloves were made close to the same year. This one has the heel break on the pinky side and much like the gloves I used in high School. Had been looking for a nice condition Sonnett Lightning with black label to complete my group - think I have all the variations now including the prototype. I thought there was only the green label version. Nice finds! I happened across this 1940's Stall & Dean glove on ebay. Despite the build up of grime from use, the factory markings on the front and back were great. The weird back panel design was the S&D response to the Wilson "Kurvform" patent circa 1940. It's a big glove, all intact and cleaned up surprisingly well. It's a "Ted Williams" model 8084. I especially like the quirky "fishtail" wrist strap pattern.